History sure has a habit of repeating itself, even with ejections and controversy. Just one year before Marty Foster ejected Nationals 3B Anthony Rendon for a post-strikeout bat flip, umpire David Rackley tossed Joc Pederson for throwing equipment after the Dodgers center fielder struck out in a similar Opening Week game. Related Post: MLB Ejection 002 - David Rackley (1; Joc Pederson) (4/6/17). Related Post: MLB Ejections 008-9 - Marty Foster (1-2; Rendon, Martinez) (4/7/18). How bad is throwing a bat, anyway? Though Rackley's April 6, 2017 ejection of Pederson involved more forceful chucking of equipment, including a helmet spike, whereas Foster's appeared to concern a bat toss, there's more to consider when it comes to ejections for throwing equipment relative to MLB's intermediate step, the equipment violation. For example, HP Umpire Angel Hernandez on April 8, 2017 opted to issue batter Edwin Encarnacion an equipment violation in response to Encarnacion throwing his bat—inadvertently in Hernandez's direction—after striking out as the result of a check swing call by 1B Umpire Lance Barksdale. 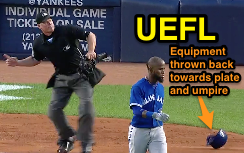 Though it appeared Encarnacion threw his equipment in response to the call, he was permitted to remain in the game. Related Post: Non-Ejection - Edwin Throws Bat Near Angel Hernandez (4/9/17). Joc Pederson spikes his equipment. At the time, the glaring difference between the Pederson ejection and Encarnacion fine was that Pederson threw two pieces of equipment (helmet and bat), with force, as opposed to Encarnacion's one (the bat). Though throwing equipment in disgust is grounds for ejection, less severe infractions may be met with warning or imposition of the equipment violation (monetary fine). This acknowledges the immediacy or "heat of the moment" reaction, while nonetheless subjecting an unsporting act to a less severe yet still tangible penalty. By throwing two equipment items, Pederson advanced past the "heat of the moment" phase into repeat or prolonged unsportsmanlike conduct territory. Related Post: Ejections - What and Wherefore? Standards for Removal (3/29/17). Ted Barrett ejects Jose Reyes after helmet toss. The sentiment is reinforced with Ted Barrett's 2013 ejection of Jose Reyes for arguing a strike three call. Following his strikeout, Reyes yelled and tossed his bat aside, earning a warning and equipment violation. As Reyes continued toward the middle infield, he slung his helmet back toward home plate, resulting in his removal from the game. Again, the first reaction and bat flip resulted in a warning, while his continued complaining and second equipment toss prompted his ejection. 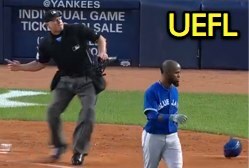 Related Post: MLB Ejection 142: Ted Barrett (1; Jose Reyes) (8/21/13). The pitch prior to the strikeout, he walked completely out of the hitter's circle, which the hitters aren't allowed to do. Marty said, 'We gotta play. You gotta get back in there.' Then when he called strike three, he threw the bat. You have some options there, and Marty felt that what he did was showing him up worse than what an equipment violation would've been, and that's why he ejected him. You have to do something or he loses all respect from the players. I understand that he could've (not done anything), but he chose that this was the penalty for what he did. So it was more involved than just strikeout, throwing equipment. Prolonged: Replays indicate Rendon did indeed leave the batter's box after Foster's strike two call. Accordingly, if the complaint began on strike two, Foster may have ruled Rendon's bat flip as a continuation of the strike zone dispute, ejecting him for his prolonged argument. Additionally, as West referred to in his comment, Rendon's actions after strike two violated Rule 5.04(b)(4)(A) ["The Batter's Box Rule"], which states, "The batter shall keep at least one foot in the batter's box throughout the batter's time at bat, unless one of the following exceptions applies." A called strike is not one of the exceptions listed in OBR 5.04(b) and replays do show Rendon leaving the box. That said, the penalty for violation of the Batter's Box Rule is a warning for the first offense, and referral to the league office for any subsequent violation (MLB) or automatic strike (MiLB). On a related note, MLB Commissioner Rob Manfred previously stated that if players are unable to adhere to pace-of-play initiatives, such as the Batter's Box Rule, on their own, the league would consider unilaterally installing pitch clocks in 2019. Related Post: Minor Teague Ball: The One Pitch Strikeout and Ejection (8/4/13). Marvin Hudson in 2015 ejected Bryce Harper for arguing balls and strikes in his failure to adhere to the Batter's Box Rule. According to postgame comments, Harper had the left his position in the batter's box when no exception applied, and, while out of the box, argued balls and strikes. 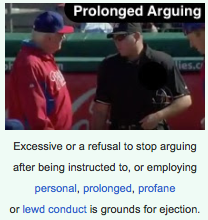 It is illegal to leave one's position to argue balls and strikes, and, thus, Harper was ejected. Related Post: MLB Ejections 051-052: Hudson (1-2; Harper, Williams) (5/20/15). MiLB's Ron Teague called auto Ks. 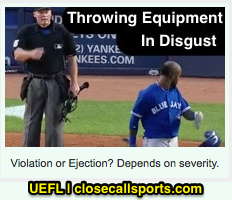 As relates to throwing equipment, MLBUM describes the difference between a warning for equipment violation and ejection for throwing equipment in disgust as follows: "If the umpire deems the action severe, the umpire may eject the offender. If league regulations permit, the umpire may instead warn the offender by issuing an equipment violation. If issued, the offender is to be notified immediately." Thus, the umpire has some leeway in both interpretation of the equipment-throw act and in determining its severity. Gil's Call: Foster ejected Rendon for throwing his equipment in disgust, which is one of baseball's Standards for Removal from the Game—no warning or equipment violation is required for a "severe" action. Complicating matters, Rendon's underlying offense was his continued strike zone complaint that persisted through at least two pitches, and this is most likely why Foster judged the bat flip to be "severe": the continued complaining served as an aggravating circumstance that contributed to the severity determination. In a vacuum and without the prior complaint, the bat flip would have been deemed minor, if anything at all; however, because of the strike two reaction, Foster's radar was up and he found the flip anything but minor. Unfortunately for Foster, the optics of the play fall victim to the optics of most continued complaining or prolonged arguing ejections: very few people will appreciate the length or persistence of the complaint. Based on Rendon's actions after strike two, it is clear Rendon is attempting to argue balls and strikes—and even leaves his position (the batter's box) in order to get his point across. He delays the game for possibly 10 to 15 seconds before getting ready to face the two-strike pitch. After strike three, though Rendon doesn't say a word, Foster interprets the bat flip as a continued complaint in addition to equipment being thrown in disgust, making it, in Foster's mind anyway, a severe offense meritorious of ejection. On its own, this likely was an equipment violation waiting to happen. In all, this sequence appears to qualify as the umpiring equivalent of "he baited him into an ejection."